Wild Bottlenose Dolphins spotted off the coastal shores in the Bay of Islands off the North Island of NZ. The true excitement aboard the dolphin watching trip in the Bay of Islands off the North Island of NZ, is when the wild Bottlenose Dolphins appear off the coastal shores. Searching the surface of the water for the small, dark fins, passengers get extremely excited when these cute marine mammals are spotted. The crew aboard your dolphin watching trip can tell you the names of most of the wild Bottlenose Dolphins which frequent these coastal waters around the Bay of Islands. Another lesson passengers learn is how to understand and really appreciate the true beauty of these wild dolphins. Wild Coastal Bottlenose Dolphins, Tursiops truncatus, swimming in the Bay of Islands, Northland, East Coast, North Island, New Zealand. 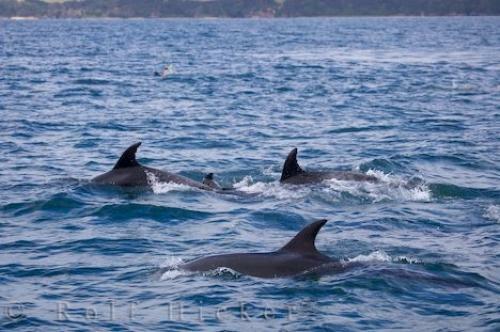 Photo of the wild Bottlenose Dolphins surfacing in the Bay of Islands off the coastal shores of the North Island, NZ.